Late in the afternoon I went up to the Studio. 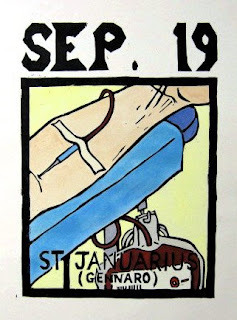 First I checked yesterday's coloring on St Januarius. It looks fine. It's done. Mostly I was there to put together some prototypes of some transforming books. 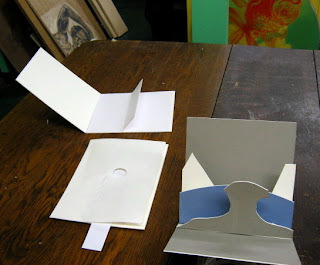 This is a project I am doing with some of my classes for their final- pick a famous painting or color print, and produce it either as a 3 dimensional pop up (bottom left), a pull tab (substituting one piece for another, bottom left), a folding flap (top), or a transparency change. I showed the students slides of completed ones by previous students, good for showing the concept, but not for the details of the engineering. Occasionally I've built quick ones in class out of scrap paper, but today I decided to make more permanent versions of some of these from matboard, remnants of which Molly has in abundance. Actually, Molly was there in the Studio today, working on a sign project and sketching for a new very large piece. I was there longer than I expected, but we had some good tunes playing, and when we left, my samples were done. Sorry that things have been so quiet around here of late- a combination of a lingering spring cold, and busy times with all my jobs, has mostly kept me away from working on any new projects. Or even posting all the details of art related stuff of the past week. Today I'll catch you up. A few weeks back I started yet another blog, this one on behalf of the Belmar Arts Council. The idea is to have a place to post stories, images, and comments about our regular activities, and to be a supplement to the BAC website, the way this blog supplements my website. However, unlike this blog, I'm planning this as a team effort, since there are many activities that I don't participate in, and it makes sense that those who are there should do the posting. Earlier in the week I was advising (via e-mail) the first team member on potential issues with converting his press release to a blog posting. Today I saw him and other members at the Boatworks when I was picking up my piece from the extended version of the juried show. I went over these concerns with him and other board members there. Then on to the Studio. A few days ago, while I was up at the Studio, I walked over to Crybaby Gallery in Asbury, enjoying the summer-like weather. Partly it was to check out the new show of installation art, called "floor, ceiling, wall". Some samples can be seen above- up top a composite image of pieces by local artists Bradley Hoffer and porkchop (yes, that's right) and below that most of another by Atlanta based artist Charlie Owens. My other goal was to finally show the owners some of my artwork. Only one was in, but she was agreeable, so I went back to the Studio and retrieved some samples of work. She seemed impressed with what I showed her, a mixture of series work and individual pieces. Nothing decided about showing in gallery yet (it looks like it would 2009 the earliest), but she does have another possible opportunity, an Asbury art festival coming up in early June. She especially liked the supermarket prints, and requested some images to show to the others involved. And this morning I e-mailed those to her. 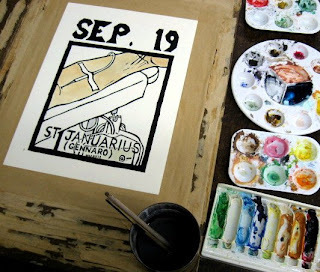 Up at the Studio this afternoon, my goals included finishing the coloring of the second proof of St Januarius. Had one little problem- I was putting in some of the lemon yellow tint in the background, but found there must of have been a speck of blue nearby, resulting in the yellow field in the upper left being contaminated. Couldn't fix that until it dried, so I took another walk to Asbury. I figured that I'd see if my e-mail arrived successfully, as well as show the owner an example of a framed supermarket print- the one I had just picked up in Belmar. However, this time the other owner was there, so I nothing was done regarding those things. But I used the visit to take the photos above, which may come in handy with class lessons next fall. When I got back to the Studio, I went over everything on St Januarius with another layer of color. It was still wet when I left; it's probably done, but I'll know for sure next time I'm there. I got to put in a few hours in the Studio this afternoon. Took care of some teaching related stuff- printing a late student woodblock and picking up a collograph I printed for another student on a previous visit. 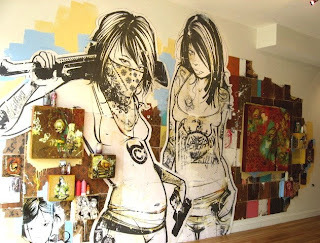 Gave a building tour to an artist who wandered into the Studio, curious about possibly getting a space of her own. I taped down two proofs to color. One was the second proof of the Januarius print. Put down washes of the skin, armrest, and some grays on and around the blood collection bag. I'll even those out and add the background and blood next time. The other print (seen on the left) is a recently pulled proof of a print I produced a few years ago down at the Print Blitz at U. Texas-Arlington. 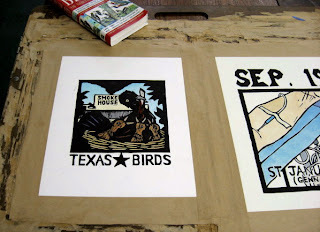 Nancy Palmeri brought a whole bunch of printmakers to town (including a number of the Outlaws), assorted students from our various programs, art students from the college, and some top Dallas area high school artists, for a week of intense printmaking. It was amazing. We were all pretty much in the studios by 10 am every day, and were often there past midnight, except for some meal breaks and some occasional excursions. One such trip was to the art museums of Fort Worth. On the way there we stopped for some great barbeque, which we ate at some outside tables, where I witnessed the greasiest scruffiest grackle I've ever seen picking through scraps left on vacated tables. Back at the studios that evening I drew and cut a block where I imagined that Texas birds brought spare rib bones back to their chicks in the nest, instead of the traditional worms, etc. The next day I printed a small edition of the black and white print. The purpose of this new proof was as a possible donation for a Printmaking Council benefit. They're showing small works that will be available to those who buy a ticket to a function coming up in May. Though it was designed as a black and white image, I decided to try coloring it. If the colors look familiar, it's because some are taken from the recent tower print. I think it works pretty well. The one issue is that the official donation deadline passed a few days ago, so I need to find out if they would still want me to send them one. If so, I can get it in the mail in the next few days and there before the show of this work that opens this coming Friday. I was feeling a little better today, so I went into the Studio to get some work done for the first time in over a week. Went in a little earlier than usual, since I knew there would be a matinee performance of the latest theater production. As a special treat I had some newly released Neil Young early 70's concert recordings discs (thanks Dave!) to listen to while I worked. Although I had been thinking green for the background, after considering the image over the past week, I decided that wouldn't work. Like I said last time, the green tints I played around with were too similar to the light blue armrest. And it had to be a tint- a bold saturated green (or any other hue for that matter) would be too strong compared to the pale blue, dull dark red, and gray tones that made up the rest of the color. It occurred to me that the obvious choice for a color that would contrast well with the blue and red was a yellow, the one color that had nothing in common with the first two. (a lesson I had just done with two of my classes over the last week) A straight yellow would still be too intense, so I mixed lemon yellow and white, tested it on some scrap, and then put it in everywhere. I think it works. I went over the light blue with another couple of layers to even it out. It seems done to me. This coming week I'll stretch and color the other copy, and start thinking about what my next project will be. As I left today, about 45 minutes before the start of the show, the lot was already full, and someone was very happy to have my parking space. The lack of postings over the past week can be explained fairly easily- I've been sick, the bad cold that's been going around at all my workplaces. I'd been surprisingly healthy in recent years, considering how many potentially sick people I get exposed to, but I guess I was due to have one catch me after a few years of relative luck. Anyway, with no immediate deadlines to worry about, I decided to save my energy for my classes, and not worry about finishing the latest print. Maybe tomorrow. But that doesn't mean I did nothing this week. As an artist I have found that pretty much every opportunity leads to another. The latest example is my recent show in Lakewood. A week after it was down, my contact at the school passed on to me the phone number of someone who wanted to talk to me about a show. I called that person, who provided a few details and gave me another contact. Followed up with her last weekend, just before the cold arrived. Today I finally got something in the mail to her- not a full proposal, but some basic materials (cover letter, resume, a few postcards and photos) to look over. The proposed curated group show is almost a year away, so I'll save further details until we get a lot closer (and I actually know anything official). Today was definitely a spring day. 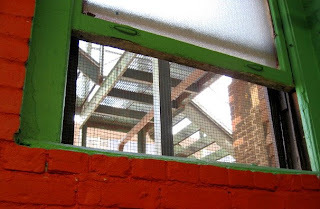 Had a window open in the Studio while I was working for the first time this year. I continued with the Januarius proof today, adding some blue colors (needle, armrest), some more neutral (clear plastic), and the dark blood color. The image is much easier to read now than it was before the color. I still haven't quite figured out what I want to do with the background yet. I played around with some tints of different greens (figuring it would give a little more emphasis to the red in the red-black blood), but I thought they were too similar to the light blue. I'll think about it a few days, get back to it next week. I had a little spare time during the day, and went up to the Studio. 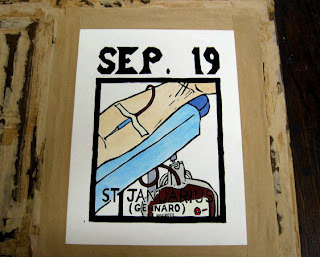 I stretched one of the copies of the new Januarius print on a drawing board with paper tape. While that was drying, I decided to go ahead and print a whole bunch of student blocks. That took quite a while. I did get back to coloring the print, but didn't have time to do much. I put in the skin tone and some other neutrals, before packing up and heading home.